Mold development in your Voorhees, NJ property is not only unpleasant, but can be very threatening and damaging. When it comes to mold, MasterTech’s certified team of experts understands and appreciates the risk that you and your family are up against. That is why we have taken every measure to scrupulously train each of our inspectors and technicians to handle all cases swiftly and efficiently while remaining mindful of you and you family’s safety and best interest. At MasterTech, we are devoted to providing the safest and most effective mold remediation services possible in the South Jersey area. 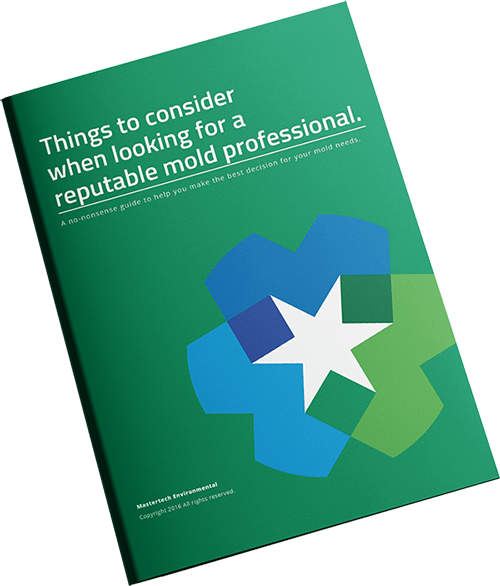 If you are suspicious of a potential mold infestation in your residential or commercial property, your first step is to consider having a certified mold inspector in Voorhees NJ conduct a mold inspection. Our mold inspectors undergo extensive training to ensure they are fully qualified to properly handle and report on your mold issues. MasterTech mold inspectors are trained to use the safest equipment and techniques to conduct a comprehensive investigation of your Voorhees, NJ home or business for any and all mold development. At MasterTech we are committed to you and your family’s safety and best interest. We emphasize safe and effective mold removal in Voorhees, NJ. Our team of industry certified experts have strategically developed a detailed, step-by-step mold remediation process that implements the safest and most up-to-date mold removal methods and technologies. To ensure that Mastertech Environmental continues to provide the safest and most effective mold removal Voorhees NJ, our mold remediation team follows strict quality assurance steps to make sure the job was done right. Part of that is our post-remediation verification (PRV) testing that is included with each mold removal. Furthermore, Mastertech backs each mold removal with a 5-year mold remediation warranty. It is our guarantee that the mold was properly removed and will not regrow. 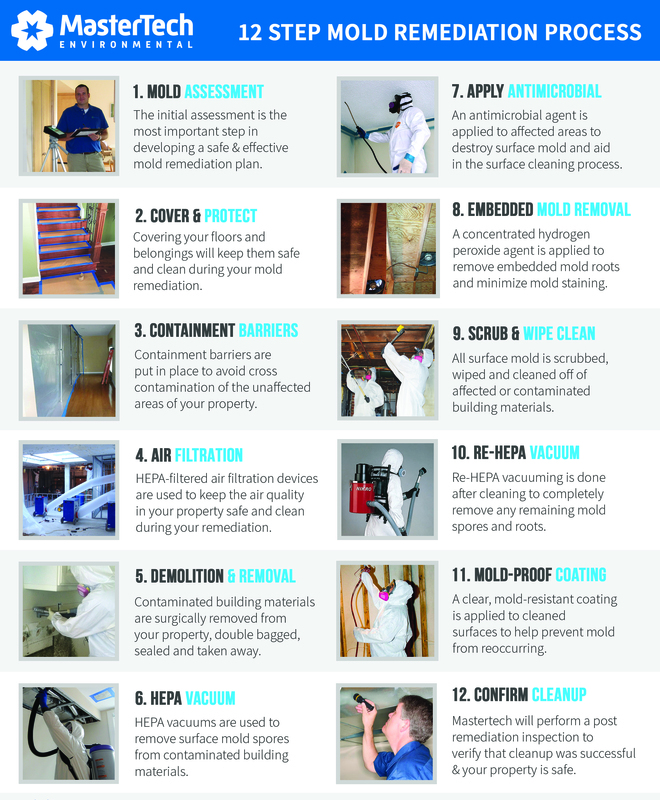 Mastertech mold remediations are broken down into 12 detailed and strategic steps to ensure that your mold remediation Voorhees NJ is completed to the highest standard from start to finish. As proof of our commitment to doing the job right, we always complete post verification testing to confirm that the job just done accurately. We also back every mold remediation with a 5-year mold-free warranty. When it comes to you and your family’s health and safety, you cannot risk hiring someone to do the job wrong. A bad mold remediation might leave you with more problems further down the road. It is important that you take the time to thoroughly research your options. You want to be sure to hire the right company for you and your family. MasterTech Environmental is a family owned and operated, local South Jersey mold company that specializes in environmentally services. We are one of New Jersey’s top rated Mold Damage Contractor for residential and commercial buildings. If you suspect mold development in your New Jersey residential or commercial property, call us today to schedule a Camden County, NJ mold inspection. For mold removal and mold inspection Hi-Nella, NJ or mold inspection and mold removal Pine Hill, NJ call 1-800-310-3226 to speak with a member of our team.